My family and I thought my 87-year-old grandmother’s finances were in great shape and ready for anything. We were wrong. We all considered my grandparents as well-prepared for aging as could be. Unlike many women her age, my grandmother worked full time almost all her life. She was a community college administrator, a job with union protections and benefits, and took a turn as union steward. Grandma receives a pension and has a healthy amount of savings, a medical directive, a will, and a trust. And, Depression baby that she is, Grandma’s favorite hobby is tracking budgets and saving pennies, a boon to her profession when it came to budgets and accounting. My grandfather held a lifelong federal job at the Department of Defense after serving in World War II and Korea. My grandparents were extremely fortunate: they had two stable incomes; benefitted from historically high wages and low housing costs; stayed happily, enviably married for just shy of 63 years; and no one died early, divorced, or had to raise my mother, their only child, alone. Even so, mistakes were made. Emergencies have a way of clarifying what really matters and, often, only tests bring weak points to light. 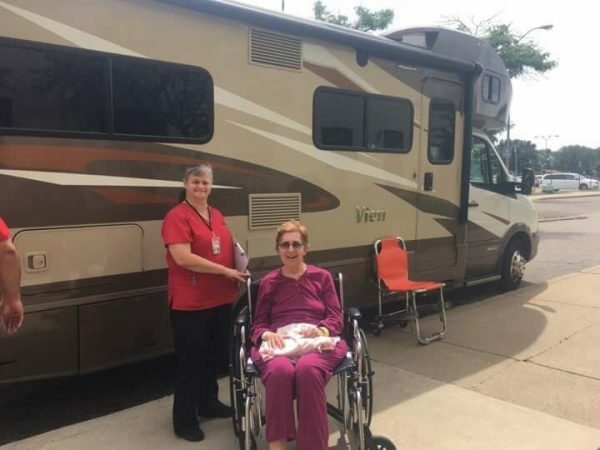 We weren’t prepared for Grandma going to the hospital, getting Alzheimer’s, and moving cross-country to California to live near me (via a medical transport Winnebago). My grandparents’ finances weren’t prepared either. Here are the five biggest eldercare emergency lessons my family learned in the process, which I’m sharing in the hopes that you and your loved ones can prevent similar mistakes. Lesson #1: Keep substantial cash liquid. Planning only for inheritance is not a plan. My grandparents saved their money, but they never thought they’d need any for themselves. To this day, my grandmother believes she will die in her sleep — which is wishful thinking. Though generous in spirit, these beliefs (as well as an exclusive focus on interest rates) had the unfortunate effect of tying virtually all of my grandmother’s money up in long-term IRAs, CDs, and the like. Maturity dates on these accounts stretch into 2023 and beyond, to years so far in the future that even my mother is unlikely to be alive to inherit them. Closing such accounts early means paying huge penalties that would wipe out all interest gained over the lifetime of the account, at least. When my grandmother entered the hospital last year, she had only $3,000 in liquid, accessible cash. Her single credit card had a $1,500 limit and an $800 daily limit. Given U.S. medical costs, it may as well have been $0. At risk of stating the obvious, not having liquid cash during an emergency hurt. The medical transport alone cost over $16,000, and my husband and I had to pay for it. Between Medicare and supplementary Blue Cross, my grandmother could not be better insured, but her insurance did not cover “optional” medical transport. If you are, or have, an elder who is fortunate enough to have savings, make sure at least $10,000 is in an accessible, low- or no-penalty savings account, like a money market fund. $50,000 is better, and if your elder can afford it, set aside $100,000. All told, my grandmother’s small share of her total 2017 medical expenses was a staggering $76,000. We must fix health care affordability in this country; most people do not have this kind of money lying around, waiting for medical bills to arrive. In lieu of (or in addition to) liquid savings, open an emergency credit card with a $10,000–$20,000 limit, if possible. Issue multiple cards to trustworthy, responsible family members, in their own names, so that they can use the card to pay for an elder’s medical expenses. Lesson #2: A trust is nothing without a trustee. My grandparents created a trust, but bank accounts had not been opened in the name of, or to benefit, their trust. In addition, my grandmother was the only person who could functionally operate funds within the trust and, all of a sudden, she could not functionally operate. Even if my grandmother had had more liquid cash in a trust, no one else would have been able to use it — legally – without being a named trustee. We’ve learned. Today, we have a checking account, opened in the name of Grandma’s trust with me as trustee. I can legally operate the funds in this account. I’m glad we have it, but I sure did need it back in July. Lesson #3: Practice security authorization awareness. Even if your elder family member has money set aside for their care, can anyone actually access that money? My grandmother was in pain, receiving morphine injections, and was in no position to provide account information, no matter how much it was needed. Consciousness is not a given. Do estate plans include the pin code to the debit card? My grandmother forgot hers. Do you know (or know how to find) the online passwords required to log into accounts and transfer funds? Do you know where the checkbook is, and do you have signatory ability? What about multi-factor authentication for online accounts? As banks add new online services, they often add security processes, too. My grandmother’s bank attempted to send six-digit authentication passcodes to the number they had for her, which turned out to be her landline phone. Another bank’s security protocol required Grandma to call them from the phone number on file, which was her landline number — problematic once she was admitted to a hospital and no longer had access to her landline phone. Even if your elder does not have or use any computer or mobile devices (increasingly rare), banks often create default account security features. Know what these are, how they work, and what needs to change. Should you consider a joint email account where specific types of communications, including security codes, can be sent and shared? Some password software, such as LastPass, include features for exactly this purpose. Last Pass calls it Emergency Access, and if something unexpected happens, gives previously-identified individuals access to your password vault. This kind of tool would have been incredibly helpful during my grandmother’s emergency and the months following. Lesson #4: Finish, notarize, and file paperwork. My grandparents had Do Not Resuscitate (DNR) orders and a will, but their paperwork was incomplete, decades old, and disorganized. Most estate papers did not, for example, include married names or current addresses, which could have presented a problem if anyone had asked for identification when deciding not to put Grandma on a ventilator, for example. Today, Do Not Resuscitate (DNR) orders do not cover everything. In my grandmother’s state of Michigan, a DNR is only an order to not attempt CPR if the patient’s heart and/or breathing stops. In many states, several life-sustaining treatments are considered separately. There are, for example, DNI (Do Not Intubate) orders, orders to prevent artificial nutrition and/or hydration (tube feeding or IV fluids), and orders to not provide dialysis. Medical directives should be prepared, signed, and notarized with all of these specified. Get signatures and notarizations while everyone is able to give them. Though my brother and I signed Power of Attorney (POA) papers one Christmas, they were never notarized. During my grandmother’s emergency, I had to pretend to be my mother, who is my grandmother’s legal next of kin. For better or worse, no one attempted to verify my identity (yep). Make original, notarized copies of especially important papers easy to find, like in a plastic sleeve attached to the fridge with a magnet. Make sure other people have copies of wills, medical directives, Power of Attorney papers, and so on. Make extra copies so that, when someone is admitted to the hospital, you can place them on file, at nurses’ stations, and where attending physicians can see them. They’re the ones who give (or don’t give) orders to resuscitate. Lesson #5: Keep important files up-to-date. We thought my grandmother had all of this information easily available to us, but her worsening Alzheimer’s meant that folders that appeared organized were not. My grandfather’s military discharge papers from the 1950s were right there with an article on mutual funds from the 1970s, a 403(b) form from the 1980s, and a tax return from 1999 and 2015. It took me days to find my grandmother’s 2015 and 2016 tax returns. Label a binder or folder with a name like IMPORTANT PAPERS, and put all of them in one place. Include a list of all bank accounts and balances; key contacts (doctors, accountants, attorneys, caregivers, etc. ); estate plans and documents; lists of medications; and the past three years’ tax returns; passports; birth certificates; marriage licenses; property deeds. Don’t forget to update these papers regularly, and cull old documents. Now that the emergency is over, what do we do differently? As soon as Grandma regained mobility, we met with an estate attorney. As a resident of a new state with different laws, Grandma got a new trust, medical directive, will, and appointed me as her guardian and trustee. To make more liquid cash available, we closed the account with the lowest penalty for early closure and transferred it to the checking account held by the trust, which I can administer as trustee. I maintain eternal vigilance. The mental overhead of eldercare is the biggest challenge of all. I gather and ready all of Grandma’s tax materials, request and handle her required minimum distributions (surprisingly painful), and pay all bills because she cannot remember if she’s already paid them. Many companies send double bills, or send a bill for a single item (say, $56) that is also included in a multi-item bill that arrives immediately before or after the single-item bill. Not helpful. Overall, Grandma’s life in California costs a lot less than it did in Michigan, thanks to the tax benefits from medical deductions. I’ve spent a lot of quality time with IRS Publication 502, and all of Grandma’s expenses (including assisted living rent and care) are deductible. This is because Grandma entered assisted living as the result of medical need, not personal choice, and because she meets the IRS definition of a chronically ill individual. Understanding the tax benefits associated with eldercare costs is key to their affordability, and well worth working with a tax accountant to understand. Periodically, I download checking account transactions as a CSV file and preserve medical expenses in a spreadsheet. This ensures Grandma benefits from as many medical deductions as possible. I do my best, which is all any of us can do. Stephany Wilkes is a writer, bean counter, and sheep shearer, whose work has been published in Hobby Farms, The Ag Mag, The New Stack, Midwestern Gothic, various academic publications, and on her blog, West by Midwest. Her first book, Raw Material: Working Wool in the West, is forthcoming in October 2018 from Oregon State University Press.